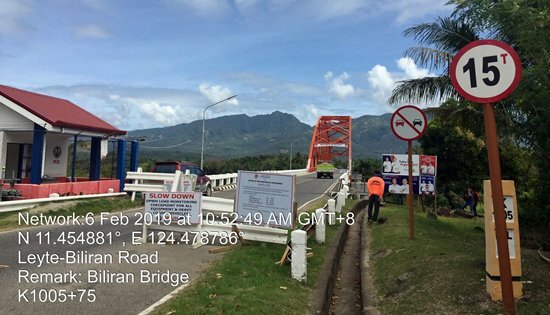 NAVAL, Biliran – The Department of Public Works and Highways (DPWH) Biliran District Engineering Office (DEO) informs the travelling public to strictly observe the maximum 15-ton allowable weight limit for vehicles passing Biliran Bridge. David P. Adongay Jr., District Engineer said that Biliran DEO is conducting a load monitoring checkpoint for all equipment and heavy loading vehicles crossing the bridge for safety precaution. Meanwhile, Engr. Glenda G. Dagalea, Chief Maintenance Engineer said that they only allow heavy equipment vehicles to cross Biliran Bridge one at a time to preserve the old structured bridge. The Biliran Bridge is the only access by land of the entire island-province of Biliran to the island of Leyte, and practically, of the entire Philippines. Completed around 1975, this bridge is about 120 meters long at its central span, held in place by an arched steel structure which hovers above a short and narrow channel of water measuring about 100 meters wide at low tide.